Majestic Creek Country Club is set within an array of pineapple, sugar cane and tapioca plantation and rolling hills create a magnificent natural backdrop. A number of natural streams crosses the greens and creates natural hazards. The 27-holes are divided into three courses, the Creek Course, the Lake Course and the Waterfall Course all offering different levels of challenges. Having recently undergone major renovations of the first two courses with the third being completed over the next few months, the courses play excellently now and are a delight for the eye. Several signature holes define the different courses, particularly the Waterfall Course with the Pranburi Dam and mountain backdrop is a stunner, especially with the signature 5th hole (par-3) backing onto a waterfall. The clubhouse has also been renovated and offers locker rooms, a pro shop and golfer’s café with snacks to enjoy and offers panoramic views of the course. Practice facilities include two putting greens and chipping area as well as grass driving range. 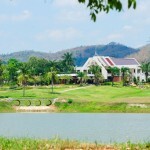 The Majestic Creek Resort offers well-designed rooms and suites with various facilities for the entire family to enjoy. A great escape from the hustle and bustle of the big city. As part of its major overhaul and expansion, Maestic Creek Country Club will be launching a number of properties for sale shortly. Golfasian is representing these first-class homes for sale at Majestic Creek Country Club. Contact us for further information and pre-registration for Majestic Creek properties.